City University Malaysia is established as a private higher education institutions in 1984 and is among the earliest in the country. To date, the University has eight faculties and three learning centres which offer more than 60+ programmes that have been accredited. They range from Foundation to Bachelor and Master programmes, Doctor of Business Administration (DBA) and Doctor of Philosophy (PhD). Our academicians are constantly focussed on continuous improvement exercise to ensure that our students are always getting the best from us and the industry. To always be alert and concerned to the needs of students; educate them as perfect as possible to deal with the employment and the community. To ensure graduates of the University are able to carry out duties as professionals in their respective fields. To diligently strive to produce graduates who are well balanced - graduates who are not only professional and skilled in their respective fields but also educated, cultured, courteous and always willing to volunteer and contribute to the society’s welfare & global community as a whole. City University Malaysia has many achievements on it honour roll. The University has collaborated with Vatel, a renowned international business school hotel and tourism management from France, to establish its branch, Vatel Kuala Lumpur, at the Petaling Jaya campus of City University Malaysia. It lists Vatel Kuala Lumpur as one of more than 40 Vatel’s campuses around the world. 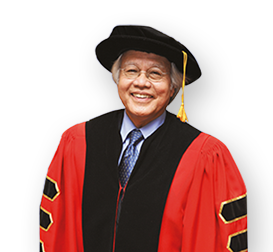 With all the achievements of being 34 years in the industry and producing over 35,000 graduates to date, and as the Pro-Chancellor of City University, I am pleased to welcome you and become part of us, citizens of City University Malaysia.